Our comprehensive range of Industrial Hose assemblies, fittings & accessories and have received the trust and faith of numerous clients all over. The tie up with reputed manufacturing companies is the reason for our success. We have been able to establish fruitful relations with reputed companies that help us in meeting the bulk and urgent orders of our clients in an efficient and prompt manner. 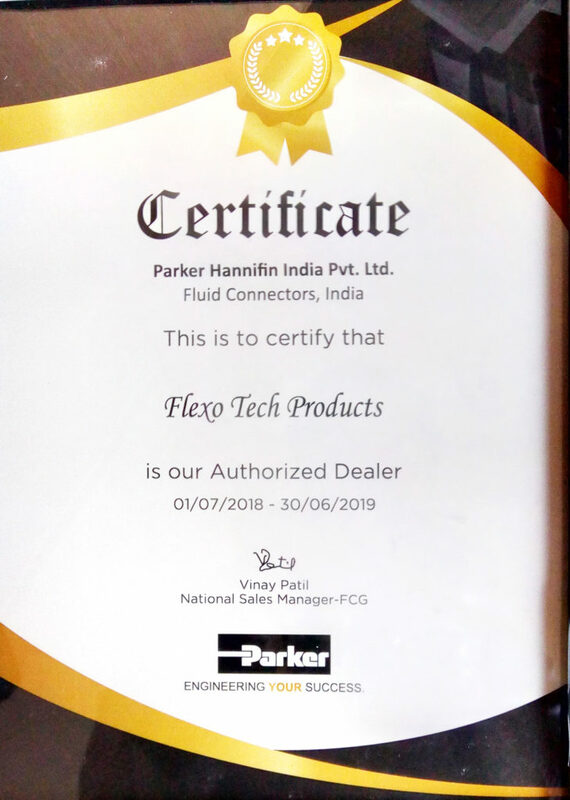 We are authorized distributors of Parker Hannifin India Pvt .Ltd. Parker has been operating for over 18 years in India. While providing quality services and products to its customers, the growth journey has continued through numerous acquisitions & green field projects. It is Parker’s commitment to bring in new products and technologies in hydraulics, pneumatics, electromechanical, filtration, process control, fluid and gas handling, sealing and shielding, climate control and aerospace. Flexo tech Products are associated with Parker Hannifin India Pvt. Ltd since long.